I have written several times about UF PRO and their products, which are a fine example of thinking “out of the box” and which surprise me everytime anew. 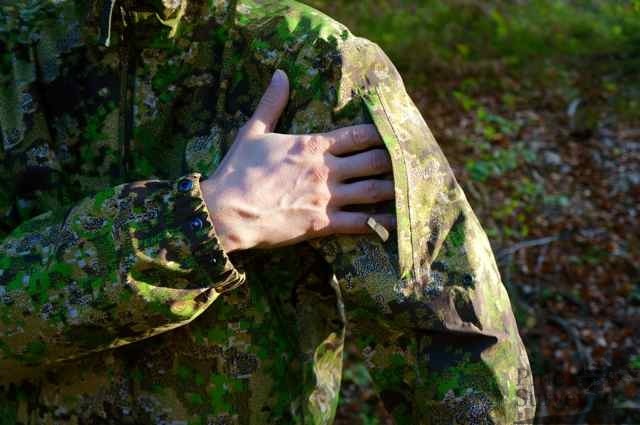 Focussing especially on the military and LE sector, the team of UF PRO can offer everything starting from Merino base layer, different uniform concepts, specialized sniper suits up until rain- and winter clothing. 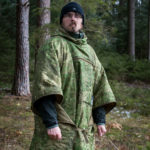 This time I would like to take a closer look at the SmallPac rainsuit of the company. The SmallPac itself is available for quite some time now in RAL7013. What’s new is the fact, that it is also available in PenCott Greenzone now. 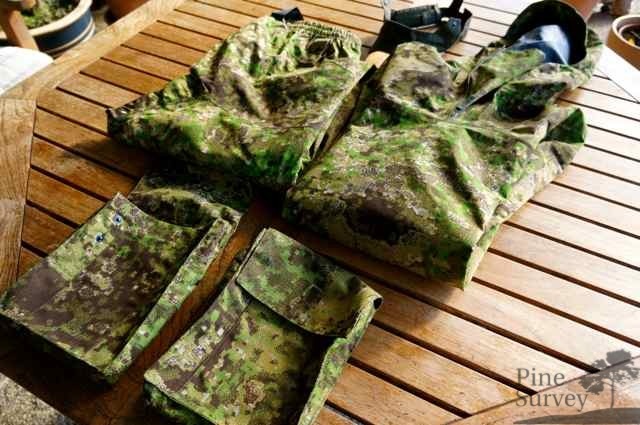 The extraordinary aspect in regard to this is the fact that for the very first time a 100% waterproof material is being used with the PenCott pattern. Up until now there were only water repellent materials available which sooner or later gave up to the elements. When is it going to rain finally? 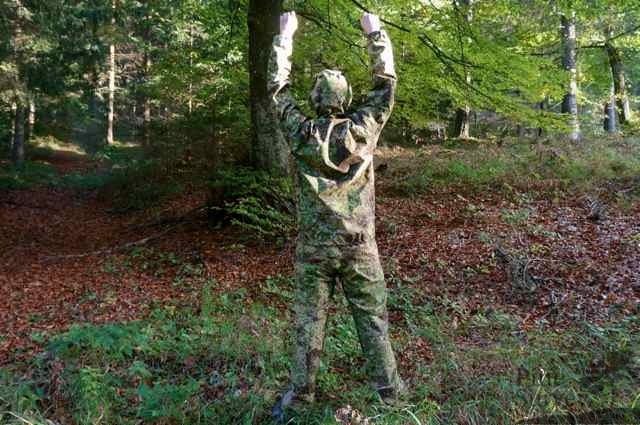 How do I take pictures in the forest on which you can actually see me despite using Greenzone in a full suit? The UF PRO SmalPac suit is designed as a waterproof rainsuit which is easy to pack and stow away while being extremly lightweight. It is to be worn over the actual clothing you are wearing. 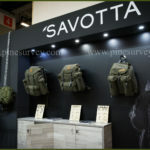 The suit comes in two small 500D Cordura pouches, which feature straps on the back to attach it to MOLLE plattforms. 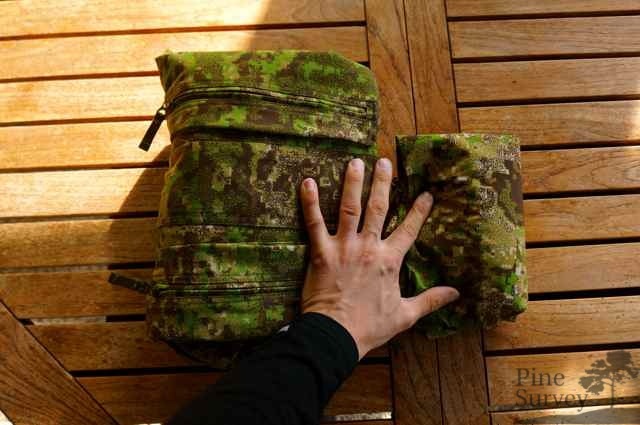 The size of the pouches resembles that of a cargo pocket on regular cargopants. 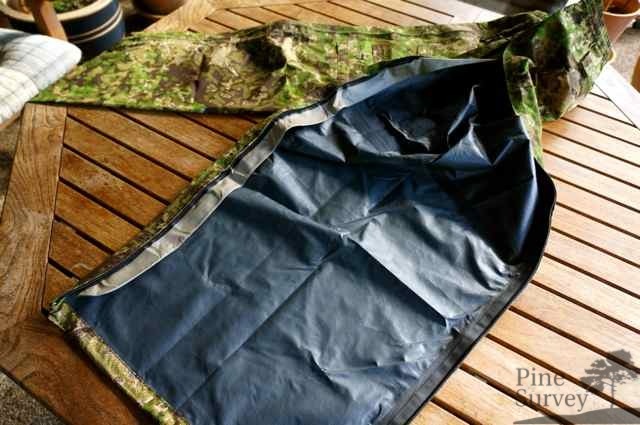 As you might guess, jacket and pants are stored separately in the pouches. 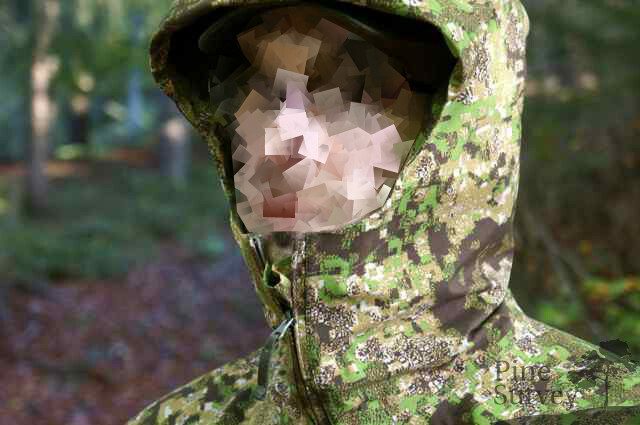 The jacket also comes with the Hood/Harness system by UF PRO, which can be attached to the hood of the jacket. More on that later. The suit is made out of a polyester face material (which has the PenCott pattern printed on it) and a Bi-component membrane based on ePTFE coated with PU dots – a membrane construction which is similar to the 2,5 membrane by GORE-TEX and which was developed in cooperation with German partners of UF PRO. With this design the material has a theoretical water column of 150.000mm! 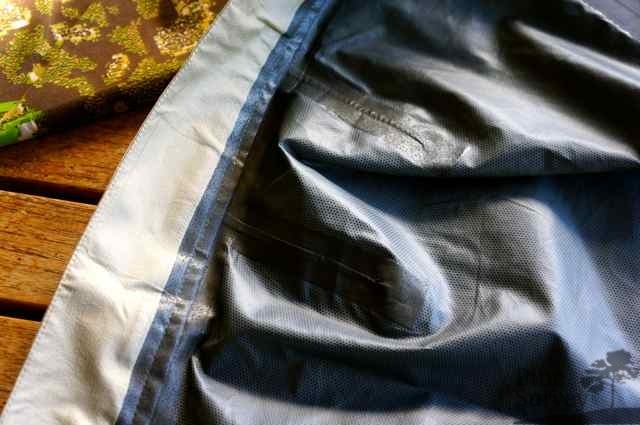 The YKK zippers used are water repellant as well (Auquaguard). To be able to ensure the most minimal pack size and weight, everything non essential was removed from the suit. This was done successfully if you consider the fact that jacket or pants fit into a pouch that is the size of a pants cargopocket. Basically one can compress the jacket of the SmallPac to a quarter of the volume of the Striker Combat Jacket. I think there is not more to say in this regard! As mentioned before the jacket was reduced to the absolute minimum. It is designed as a Anorak like pullover jacket – so it cannot be opened by zipper from the front to not give any contact surface for the rain. To offer enough room for the head while pulling the jacket over, the neck area has a large fold to widen the gap. It can be closed/opened with a zipper. If you close it completely everything is covered up until the chin. 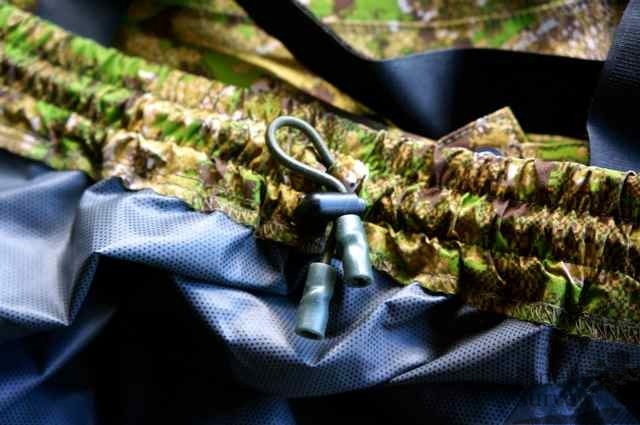 The bottom of the jacket features a drawstring made out of shock cord which can be secured with a cordlock. 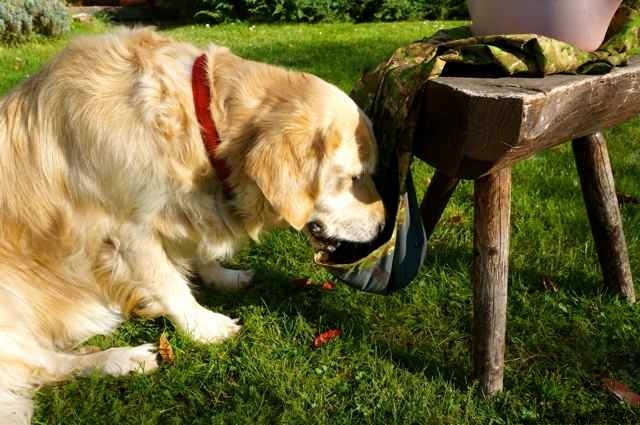 Thanks to this one can bring the jacket effectively close to the body and prohibit water to enter from down below. Also nothing is standing away awkwardly. The wristband has elastic bands sewn into the seam to make sure everything is tight. Also there are two press buttons each to close it even further if necessary. At the left upper arm there is a pocket which can be closed/opened with a zipper. 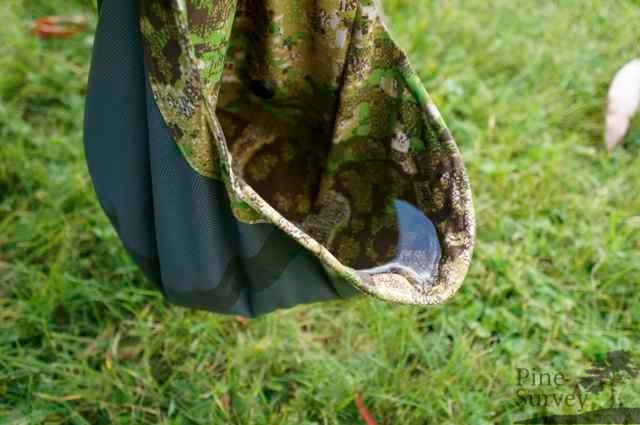 Since it is expected that sooner or later it will be penetrated by water (for example during the opening process) there is a drainhole at the bottom of the pocket. In it there is no further organisation to add no unnecessary bulk. The hood is kept wide and big. There is no doubt a helmet can fit in here. If you don’t wear one, the hood will be sized down thanks to the press buttons of the UF PRO Hood/Harness System. This system basically is a headband with a small visor. It can be adjusted to the individual size of the head and fixed to the hood with press buttons. The idea behind this is to fix the hood to the head in the most ideal way and create free space around it. This way the hood follows the movement of the head and doesn’t interfere with the point of view or the hearing senses, since the ears are not covered by the fabric. Also thermal bridges are being avoided, which can cause cooling during longer stays in the rain. 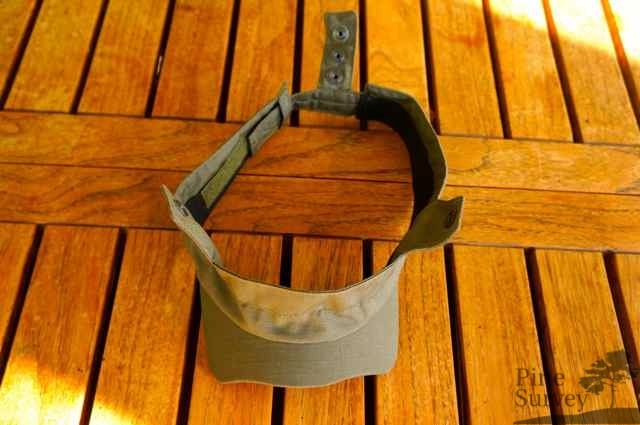 To guarantee an even better sight, the visor of the hood has a wire sewn into it, which can be bend as one might wish to prevent a collapsing of the large hood into the users face. 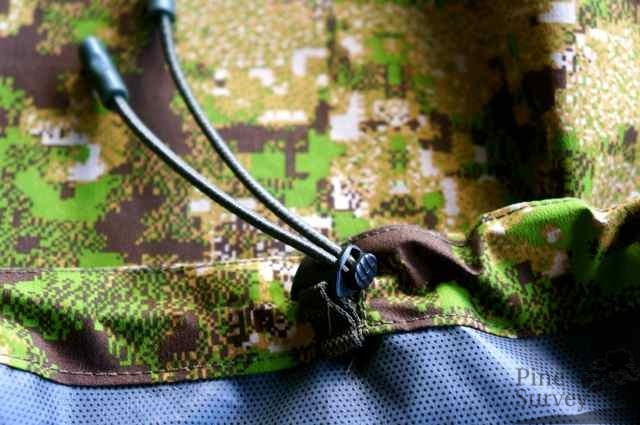 The Hood/Harness does not have to be detached each time but can be stored away without a problem together with the jacket, inside of the Cordura pouch. The pants are designed to be overtrousers and feature an elastic waistband and also detachable suspenders, which are made out of an elastic material. The suspenders are attached through a loop and fastened with velcro. Additionally there are four beltloops at 1 o‘clock, 5 o’clock, 7 o’clock and 11 o’clock. These loops are 6cm or 2 ⅜ inch wide. Right above them there are additional loops which can be closed with press buttons. 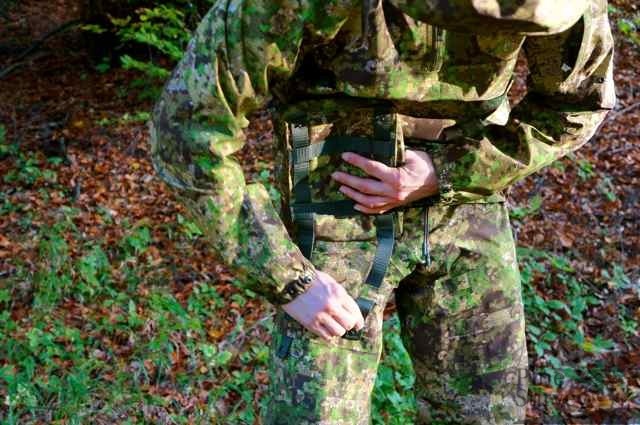 So theoretically there is the possibility to attach the trousers to a duty belt. The elastic waistband is supported by a shock cord and can therefore be fastened tighter and secured with a cordlock. To make it easier putting on the trousers, there are zippers on both pant legs which are reaching over the full length. 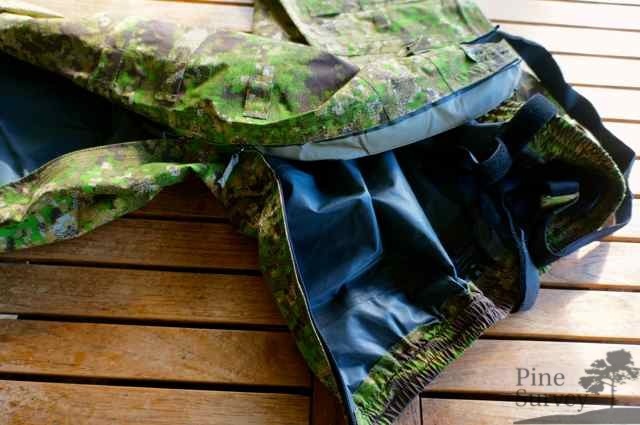 Behind the zippers you can find flaps made out of another waterproof laminate which serve as another means to prevent water from coming through the zippers when encountering longer exposal to the elements. On the left there is a two way zipper which can be opened from above and below and which is also secured by a press button at the waist. Because of this design you can widen the waist and the leg extensively to slip fast into the pants even while wearing large boots. As mentioned before this makes it a lot easier putting the pants on. 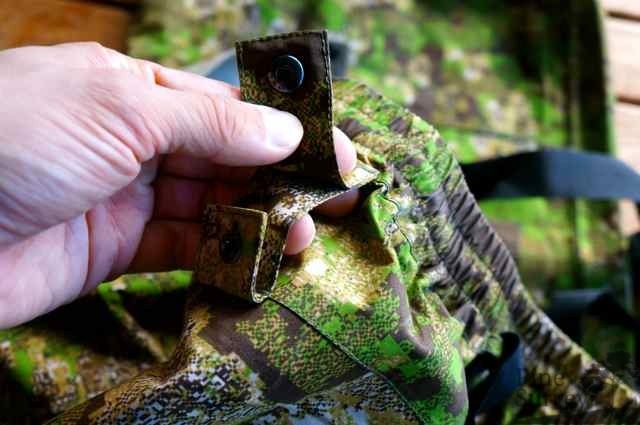 This detail is also the only difference to the RAL7013 (brown/olive) version of the SmallPac. This modification was put into the design after the above mentioned maneuver. Another proof that UF PRO does not rest on their laurels. On the right side there is also a two way zipper, but here the waist is not interrupted and therefore not secured with a press button. The slide of the zipper can be tucked away in a dedicated channel which protects the zipper. 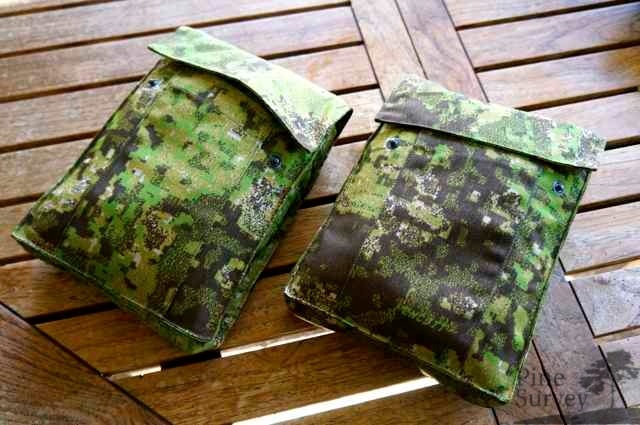 At the thighs there are MOLLE like loops which fit the straps of the included Cordura pouches. 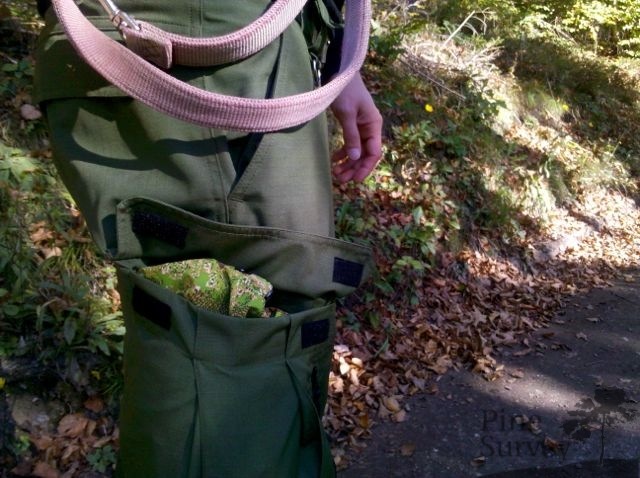 You can mount them on your thigh to gain cargo pockets and also get rid of the problem where to stow away the empty pouches. 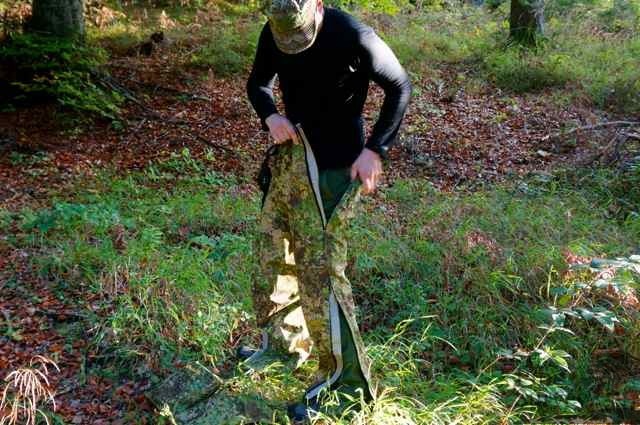 The length of the pants is slightly longer to give the user the possibility to wrap it under the pants underneath to prevent a wicking action caused by wetness from the ground. 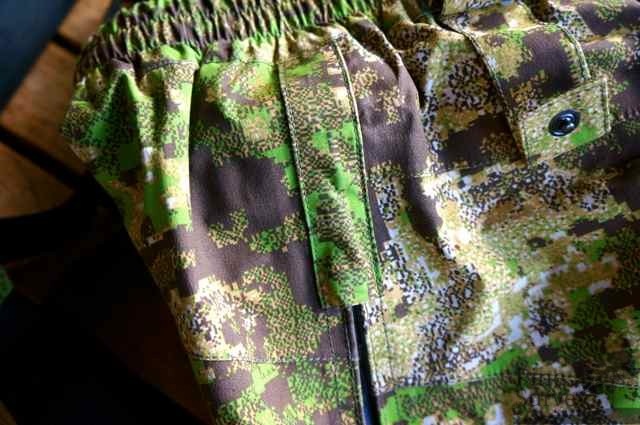 To make this more easy there is a shock cord at the end of each pant leg, which can be tightened and secured with a cordlock. I am 1,80m tall and weigh about 75 kg +/- therefore I need pants in size Medium Regular or 34/32 and jackets in size Large or Medium (only if the jackets feature a large cut, which happens not that often). Insofar I was very sceptical when Armin of UF PRO recommend Size Medium for me. After all I am really glad I actually went with that size. The suit is designed as an oversuit and therefore cut as such. You can order your regular size with no doubt and will be satisfied. The pants fit nicely over regular cargos pants or jeans (on the pictures I am wearing the p-40 classic pant of UF PRO) and the jacket even fits over my Striker Combat Jacket in size Large. In the latter case it gets tight though. All in all layering with thicker layers (fleece, regular jackets) will not be a problem. As you can see in the pictures I received the SmallPac during a time when we had the nicest Indian summer. Accordingly I had to think about different ways to demonstrate the waterproofness. One possibility would have been to stand under the shower, but I dismissed that as being ridiculous. A first experiment was therefore to turn the hood around and fill it completely with water. I did not care to look how much it was but I guess about 1-2 litres. The jacket stayed in this condition for quite some time. Around the hood there are several sealed seams and the press buttons for the Hood/Harness system. So there was not only a testing for the fabric itself, but also for the sealing of the various design components. At no point the water managed to get through! The SmallPac passed its first test. Since I took the suit with me to Vienna I was able to gather some more impressions of it as parts of the storm front “Gonzalo” reached Vienna. I was able to stroll through my neighbourhood in medium rain and wind (30km/h) and 8° Celsius. All in all I was walking for 45 minutes and witnessed different conditions from very light to pouring rain to gust of wind. Under it I was wearing Jeans and a light Merino pullover. During all of this I discovered the SmallPac to be absolutely windproof. Also – and this might be more interesting for you of course – there was no water that penetrated through the suit. Breathability was also more than comfortable. There were no heat accumulations and I never felt like wearing a rubber tarp around me (like with other waterproof jackets). I would even go so far and describe the feeling like wearing an additional T-Shirt over everything. The noise performance was like I expected. The Polyester face material causes the typical sound every other rain gear makes. I think this can be neglected during rain and its own noise levels. Thermal bridges are an important topic to mention, especially during longer durations in the rain and stationary remaining at one spot. Here you have to work against it with other layers of your clothing system since the SmallPac is only the protection against the water. 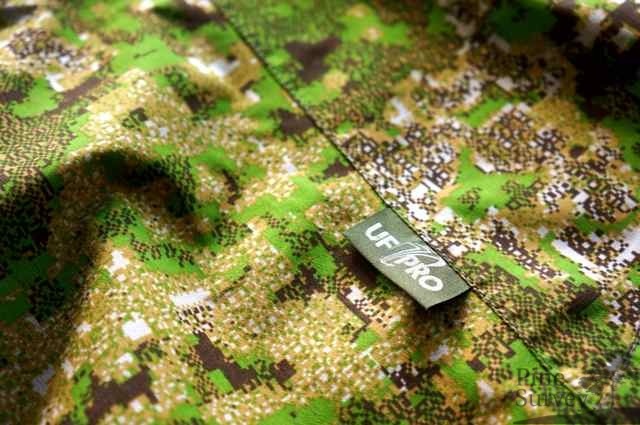 UF PRO offers every layer you can think of and also has the Air/Pac inserts in its other jackets to prevent exactly this thermal bridges. 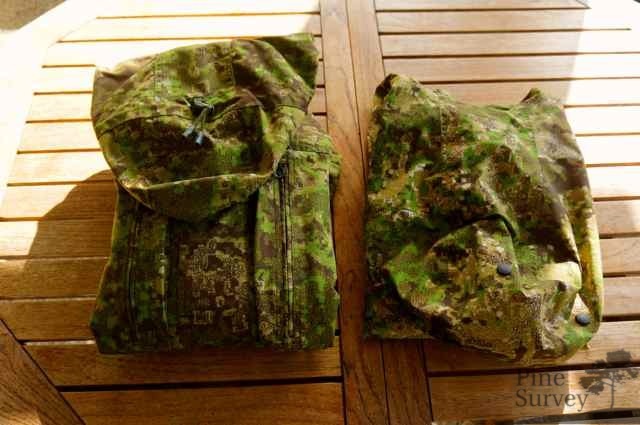 Functional textiles like the SmallPac can only be as good as the combined apparel and gear. Breathability is a very subjective perception but can directly be boosted or inhibited. Wearing only a breathable outer layer is of no use if the base layers do not transport the moisture of your own sweat to the outside. 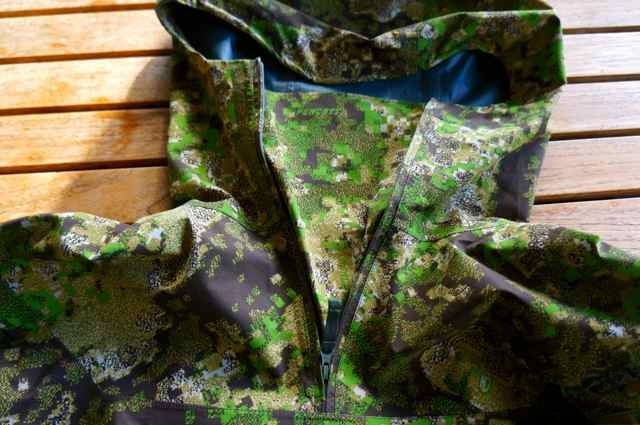 The SmallPac is a solely an outer shell with waterproof capabilities but features no textile to distribute sweat or the like. 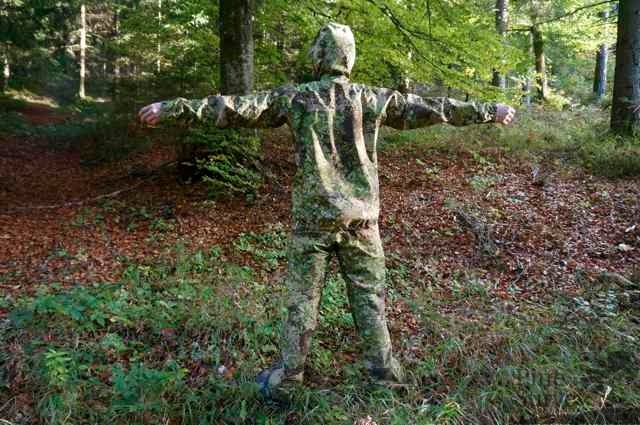 These functions have to be provided by the other layers of your clothing system (base layer, combat shirt etc.) for the SmallPac to work accordingly. With this last remarks the first part of my review is about to end. As soon as there are any long term observations I will post them in another review. 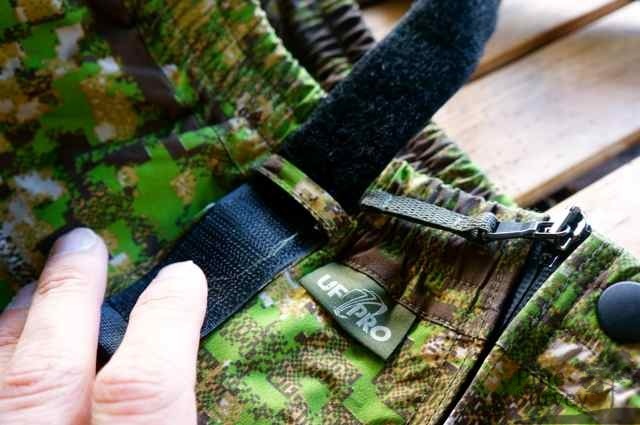 UF PRO developed another high functional piece of gear which is easily pack- and stowable. Thus you can carry the whole suit or only a part of it with you without problems. 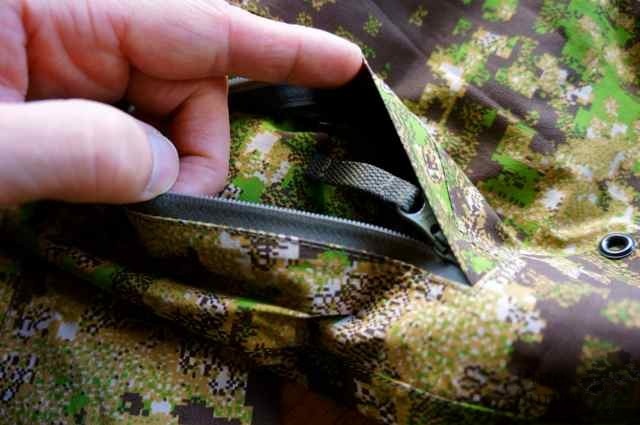 Either on your pack or belt, in the pouches which are provided with the suit or just folded (without the pouches) in your cargo pockets of your pant. I did the latter during my stay in carinthia to have a jacket with me in case the weather would change during my long walks with my dog. If you need 100% rain protection the whole suit makes absolute sense. Therefore it is only sold together as one package by UF PRO. The fact that it is available in PenCott Greenzone besides RAL7013 (brown/olive) is magnificent in my opinion. 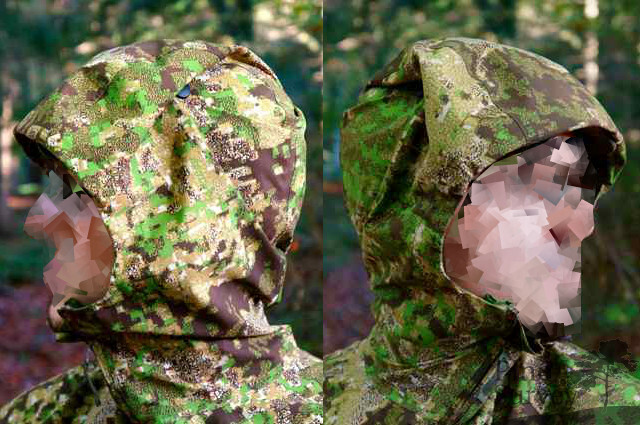 One of the most effective camouflage patterns combined with 100% rain protection will make this rainsuit very attractive in military circles – especially in our temperate parts of the world. Initial scepticism in discussions which covered the possible breathability of the polyester face material proved to be baseless. I was more than positively surprised. More observations in that matter will follow. All in all I can only recommend this rainsuit wholeheartedly if you are looking for such a product. The Greenzone version is 31€ more expensive (with a total of 530€) than the RAL7013 (brown/olive) version (499€) and can be bought directy from UF PRO or dealers that carry the products of UF PRO. To forestall a possible price discussion I want to point out that a comparable suit system made by high profile companies costs the same if not more. Also you have to consider what items (jacket, pants, pouches, hood/harness) and what quality is being delivered by UF PRO. To conclude I would like to thank you for your patience reading this and of course UF PRO who made this review possible! On a very last note: LEO APPROVES OF THE SMALLPAC AS WELL!